Median values for size statistics when σ = 1. Bands cover 50% of samples around each median. The three measures that vary with n (Extreme Spread, Diagonal, and Figure of Merit) are range statistics that lack convenient functional forms. However both the mean and standard deviation of their expected value, as well as quantiles, scale directly with σ, so it is sufficient to calculate those statistics once for σ = 1 and multiply the resulting values by the desired σ. Media:Sigma1RangeStatistics.xls contains quantiles and moments for n up to 100. The shotGroups web app provides an interactive online tool to estimate Rayleigh σ from measured range statistics, including its confidence interval. The app also performs calculations for the efficiency of the Rayleigh estimator vs. range statistics (see below). What extreme spread should I expect for 5-shot groups from my rifle? The extreme spread median from the table for 5 shots is 3.0 σ. I've determined my rifle has precision σ = ½MOA. If I take five shots at 100 yards we would expect half my groups to be less than 3.0/2 = 1.5MOA \(\approx\) 1.6". Over many tests I have found my rifle produces 5-shot groups with an average extreme spread of 1MOA. What extreme spread should I expect if I instead start shooting 10-shot groups? 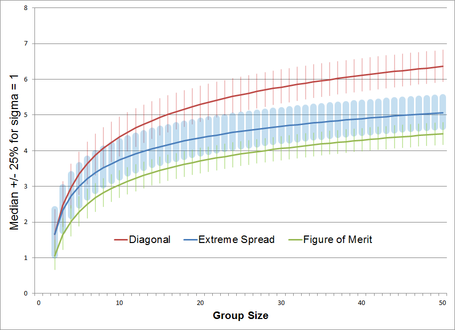 The table shows that the ratio of expected extreme spreads on 10-shot groups is 1.24 times the value on 5-shot groups. So my a priori expectation would be for 10-shot groups to average 1.24MOA. Shots per group, n – because range statistics increase with the number of shots taken. Sampling Error, E – half the width of the confidence interval for the true value, above and below the estimated value, as a fraction of the estimated value. Confidence Level K – the coverage probability of the confidence interval. Roughly, it reflects the confidence that the true value is within E of the estimated value (on either side). The width of the CI indicates the amount of uncertainty behind the point estimate - a narrower CI means less uncertainty about the true value. The precise technical meaning is harder to grasp: The CI is calculated using a method that, in the long run, guarantees it will include the true parameter value K percent of the time if all model assumptions are valid. The required data and formulas for this calculation can be found in Media:RangeStatisticEstimation.xls. 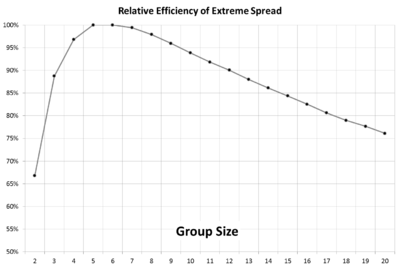 Relative Efficiency of Extreme Spread estimation by group size. If our goal is to characterize a range statistic using the least number of shots then we should pick our group size carefully. Kolbe et. al. noted that for any desired error and confidence level it looked like 7-shot groups produced a significant estimate using the lowest number of total shots fired. Using our more extensive simulations of the coefficient of variation we can see now that 6-shot groups are actually the most efficient, and that 5-shot groups are practically as efficient (and for many scenarios identical). 4- and 8-shot groups are almost as efficient, but if you're shooting 3-shot groups or groups larger than 9 shots then you are wasting bullets. In practice we are usually limited to shooting small numbers of groups, which will have significant positive skewness. In order to more accurately characterize the distribution of small samples we fall back on direct simulation to produce quantile functions. Media:ES_Quantiles.c runs 2 million iterations per scenario, with a number of small scenarios shown in Media:Extreme Spread Quantiles.xlsx. By the time we're looking at the average of five 5-shot groups our distribution has almost no skew. As noted previously, the NRA's standard for testing precision is to shoot five consecutive 5-shot groups and report the average extreme spread. As we saw in the preceding section, the 90% confidence interval for five 5-shot groups is (0.81, 1.20). This means, for example: if we measure an average 5x5 extreme spread of 1.0MOA then, nine times out of ten, we would expect that same shooter, gun, and ammunition to produce five 5-shot groups measuring between (0.8MOA, 1.2MOA). Following the best estimation methodology you can measure precision as effectively as the NRA protocol does but use only 3/4 as many bullets. Following the NRA protocol you’re spending 32% more ammo than necessary to get the same precision estimates. Because the confidence intervals overlap I cannot reject the hypothesis that these loads are equally precise. In this case the confidence intervals do not overlap, so we can say with 90% confidence that Load B is more precise than Load A. This page was last modified on 11 January 2016, at 16:48.